Ginger (Zingiber officinale), with tightly-wrapped shoots and leaf blades, is best known for its thick, knotted underground stem or “rhizome,” and grows best in warm, humid, partly-shaded habitats. It is most typically cultivated in India and other parts of Asia. However, ginger is also grown in tropical Africa, Latin America, Hawaii, the Caribbean, and Australia as a commercial crop. 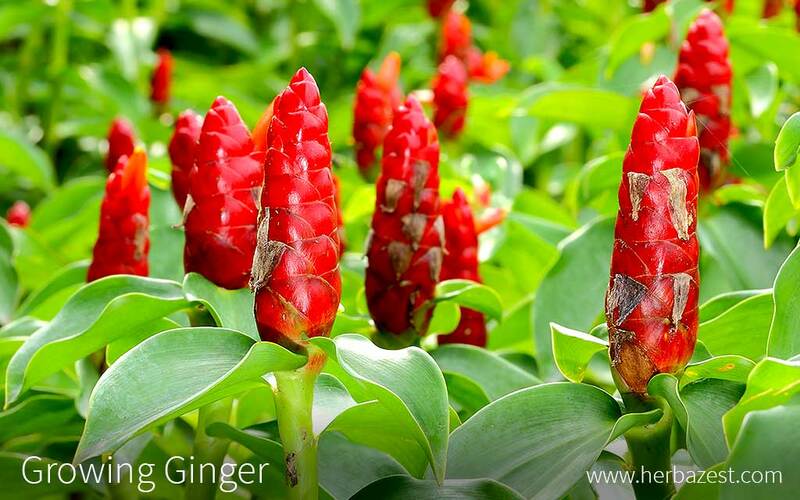 It may be surprising to know that the ginger plant not only produce tasty rhizomes or thick roots, which are well known for their medicinal and culinary uses, but it is also a beautiful ornamental herb. Ginger has very specific requirements for a proper development, which involves adequate temperature, soil type, and moisture among other factors that will ensure a successful cultivation. The following growing guidelines will allow you to enjoy the benefits of ginger at home. Ginger grows best in well-drained soils, such as sandy loam, red loam, and clay loam. Before planting ginger, the land should be ploughed four or five times in early summer. Beds should be approximately three feet (1 m) wide and 12 inches (30 cm) high. Ideally, the soil should have a pH between 6.0 and 6.5. Because ginger is an exhausting crop that requires a lot of nutrients, it should not be planted in the same soil year after year. Ginger is typically cultivated from portions of the rhizomes that are called seed rhizomes or rhizome eyes. The seed rhizomes are cut into small pieces, each one having one or two buds. The seed rhizomes should be planted in shallow pits and covered with farmyard manure and a thin layer of soil at a spacing of 8 - 10 inches (20 - 25 cm). Ginger grows best in areas with high humidity (70 - 90%) and at a temperature range of 66 - 82F (19 - 28C). Ginger is typically planted in high rainfall areas, and it requires consistent watering for at least five to seven months. The first watering should take place immediately after planting, and subsequent watering should happen every seven to ten days. Depending on how much ginger has been planted, you may wish to use sprinklers or a drip system for efficiency. Directly prior to planting ginger, apply manure or compost to the beds. In addition, the application of an organic fertilizer will help to reduce the incidence of rhizome rot and other diseases. In areas with soil that is deficient in zinc, a zinc fertilizer is recommended. After planting ginger, it is recommended to mulch the beds with green leaves or other organic wastes. This will help to prevent the emergence of weeds, conserve moisture, and prevent the erosion of soil during heavy rains. Weeding should be done right before applying fertilizer and planting. Weeding by hand should be done in accordance with the intensity of weed growth. Ginger may be affected by some pests that can damage the plants. These pests include the lesser corn stalk borer and the banana moth, and they can be controlled with Bacillus thuringiensis applications, as well as by using other pesticides. Soft rot is a very destructive ginger disease that is caused by soil-born pathogen called Pythium spp., which will build up when the soil is too wet. The fungal infection will begin at the collar region of the pseudostem and progress upwards and downwards from there. The infection will eventually spread to the rhizome, which will result in a foul-smelling rot. A strong indicator of soft rot is the yellowing of the edges of the lower leaves, which eventually spreads to all of the leaves. To avoid soft rot, when planting ginger, select seed rhizomes from gardens that have not been infected with the pathogen and plant in well-drained soil. Additionally, to reduce the incidence of the disease, you can apply Trichoderma harzianum and neem cake. Bacterial wilt, often known as ginger blast, is caused by a bacteria called Ralstonia solanacearum. It is a very harmful disease that occurs in all regions that cultivate ginger. It is characterized by leaves that droop, become yellow, wither, crimp, and eventually die. When the stem or rhizome is infected, it will show water-soaking and rot. Bacterial wilt is caused primarily by a contaminated seed rhizome, and if infected plants aren't removed, the bacteria can live in the soil. To manage bacterial wilt, select a well-drained cultivation site that has not cultivated ginger for at least 10 years. Use clean, pathogen-free equipment and rhizome seeds. Complementing the soil with organic amendments such as mulch or compost may also help suppress the pathogen by promoting healthy microbial activity. When ginger is harvested will depend on its intended use. Ginger will reach full maturity approximately 210 - 240 days after it is planted. However, if the ginger is to be used in its fresh or preserved form, it should be harvested at five months, when the plant is not yet mature and the rhizome is tender with a thin skin and mild flavor. At eight to nine months, ginger has a thick, hard skin rhizome that is difficult to remove. Ginger at this age will be more pungent and is best used in its dried or ground forms. Lastly, the concentration of essential oils in the rhizome will increase as ginger ages, so if you are looking to extract the oil, it is best to harvest ginger at nine months or older. Always store fresh ginger in a cool, dark, humid environment. Ginger's shelf life can be maximized if stored at a temperature between 50 - 54°F (10 - 12°C). While growing ginger is fairly easy, it requires patience along with the proper conditions and resources. However, if done properly, you will be able to enjoy all the health benefits of ginger with the satisfaction of having grown it yourself.